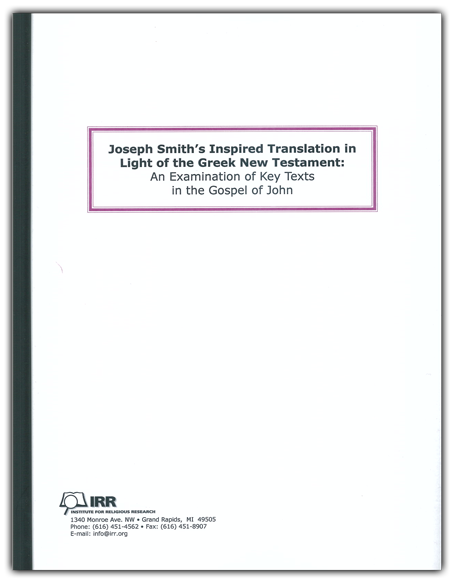 In this scholarly paper, Joel B Groat examines Joseph Smith’s claim that God gave him corrections to make to the King James Bible. It quotes Mormon and non-Mormon scholars and examines key verses in the Gospel of John to demonstrate that: 1) contrary to Joseph Smith's claims, our existing biblical manuscripts are not riddled with errors, but are highly reliable and 2) the changes Joseph Smith made to the Bible are not supported by the thousands of original language manuscripts of the Bible we have today. This study is important because the Mormon Church now includes Joseph’s spurious changes in their version of the King James Bible.